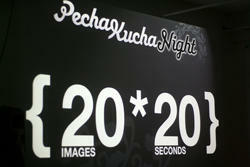 Last week I attended a Pecha Kucha Night where a select group of people individually got on stage and gave a short presentation with 20 PowerPoint slides, each shown for 20 seconds. The talks were fascinating but what caught my attention was what the host, Steven Cox, said during his introduction for the event. Steven explained that his motivation for organizing a Pecha Kucha Night in Vancouver was to help bring attention to the world-class creative talent in our city. He went on to say that it was only a matter of time until the world recognized that Vancouver had transformed itself from a sleepy little coastal community into a place where the work of unique and creative people was having a global impact. The phrase, “it was only a matter of time” made me think about how the tenacity of successful people and companies makes it inevitable that they will eventually succeed. The real estate market has had a dramatic downturn recently and, while the market flounders, we've found ourselves with the opportunity to focus on streamlining our processes to help cut costs. For example, at Lasso we've started using inbound marketing to reach a wider audience than we previously could through expensive trade shows and print advertising. Our software developers have also begun to use automated testing instead of the labour-intensive manual testing we used to do. Our leaner product development cycle is helping ensure that we continue to be the real estate software leaders for builders, developers and real estate sales and marketing companies. Companies that look for creative ways to streamline and become lean in this market will find themselves in a better position to quickly capitalize on the opportunities that open up when the economy bounces back. As Steven Cox would say, it's only a matter of time.